This was one of the older structures in the village and was torn down in 2000 because it was in danger of falling on its side. The village council met here. Council now meets in the Lions Club building. The bell tower was for a fire alarm and contained a bell. The tower to the right and behind the hall is the emergency weather siren used to warn the village of severe thunderstorms or tornados. This tower still stands. This siren is automatically activated from the county emergency center in Van Wert city. Until 1980 the village kept its fire engines behind the double doors on the right side of the building. These included a real antique hand pumper. It was hand pulled to the scene of a fire and then 1 or 3 people stood on each side of the engine and pushed up and down on the two pumping rails. The engine carried a hose and the water source was a cistern in the center of town. Of course this engine was not used for many years prior to 1980 because the village had "real" fire protection by telephoning the volunteer fire departments of nearby towns. 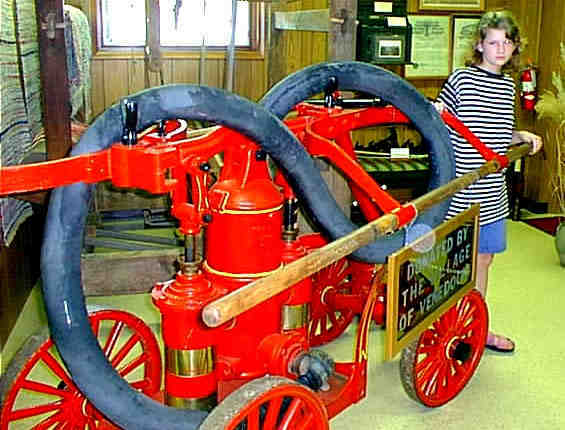 The hand pumper was donated to the Van Wert County Historical Museum where this picture was taken. 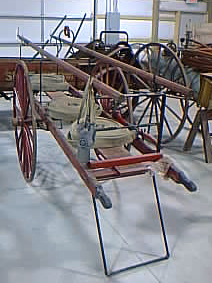 Also in the village hall was the other fire engine (above), a hand pulled soda chemical cart with hoses and fire buckets. The purchase contract for this 1905 engine can be viewed here. 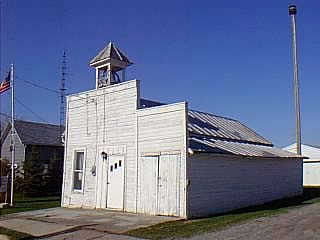 Until it was torn down the village hall was STILL the site of village fire protection. Inside were several large fire extinguishers. After telephoning the fire department you are supposed to get one of those with a key to unlock the hall and set off the local fire siren located in the bell tower. Able bodied folks hearing the siren run to the hall, grab a fire extinguisher, and then go to and fight the fire. Because everyplace in Venedocia is within easy walking distance this is not difficult to do. This arrangement is the most unusual "volunteer fire department" I have encountered.